The student ministry team at Riverland Hills have made a publication intended to keep parents well-informed but also encouraged about what is happening in the student ministry at Riverland Hills. We want to celebrate what God is doing in the lives of our students so make sure to read the recap of some of our most recent events. You will also be encouraged as you read quotes from our very own students and testimonies of how God is moving in their lives. Finally, check out our feature article on the meaning of baptism and our parent article on screening movies using IMDB.com. These will help equip you to discuss these topics with your student. We feel privileged to be a part of such an incredible student ministry and to be on the front lines of watching students grow in their faith. We hope these articles will give a glimpse of what God has been doing and what He intends to accomplish NEXT! 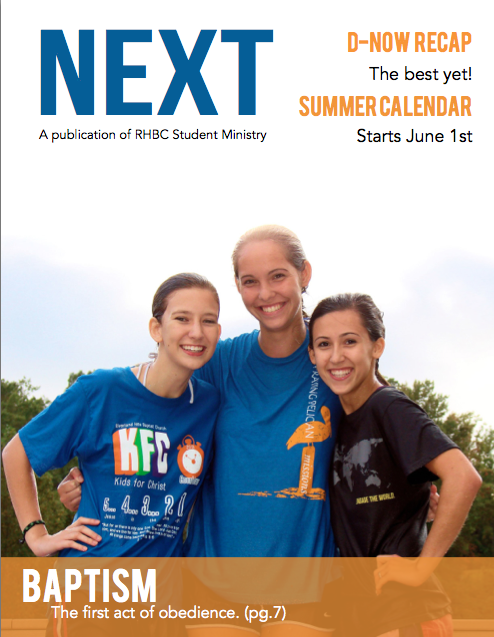 You can find view and download your copy of NEXT here. Hard copies are available at the church.